Our house in a country village 500 kms from Sydney is our escape, so the Easter break began at 2.45 am in our city apartment with both alarms shattering us. After consultation as to if we should get another hour’s sleep, we staggered into clothes and made our coffee-less way to the ute where our beloved coffee machine and stuff we’d accumulated during the preceding 3 months was pre-packed. It soon became apparent that our 3.20am departure time was inauspicious numerologically, astrologically or something, as we halted at every red light between our driveway and the freeway. I nodded off for my customary car nap so the G.O. out of boredom & despite the risk of double demerit driver’s licence points loss put the pedal to the metal and we gained time which we lost again on the outskirts of country town Kempsey where a “peak hour” rear-ender between a Hyundai driven school mum and a Landcruiser had traffic delayed for miles, not happily given my desire for breakfast & a bathroom, with no available detour. Our arrival at our pre-destination of the G.O.’s mum’s (M.I.L.) was greeted by an extended gathering of aunts & uncles who had congregated for an impromptu morning tea. Eventually we extricated ourselves and left to run errands: grocery shopping and acquiring a gas heater for M.I.L. After returning triumphantly with the heater, we departed for our own abode, still at least 30 minutes away. Arriving home at midday, via a scenic dirt detour thanks to Council closing the tarred road while they take up to 8 months to come up with a solution to a landslip, our fears were realised. It was a beautiful day, the sun was shining and part of the house was visible underneath tree & vine growth. Inside all appeared fine until you looked closely at our collection of pre-loved furniture. Courtesy of 3 damp summer months much of the house inside & out was green in one way or another. We inspected, unpacked, swept and wiped until exhaustion claimed us. At about 5pm we nanna napped until the phone rang an hour later. We had no energy to recommence work so we celebrated in customary fashion with a few glasses of wine & a bbq, then had an early night. Refuelled early the next morning by our beloved coffee machine, the G.O. braved the garden and I continued inside with the plan of joining him later until I heard shouting & swearing and found him wasp stung attacking the green vine covering more of the front of the house that it has been assigned. He continued despite his wounds until a mate turned up with a load of firewood for the yet to be installed wood heater & stayed for a couple of beers before departing with a ute load of garden clippings for the evening’s dining of his cows & chooks. We again celebrated in the usual way and had an early night. The next morning we awoke to a houseguest. I was unwilling to disturb the frog but with a visit from M.I.L. et al imminent, I thought the note prudent. STOP. 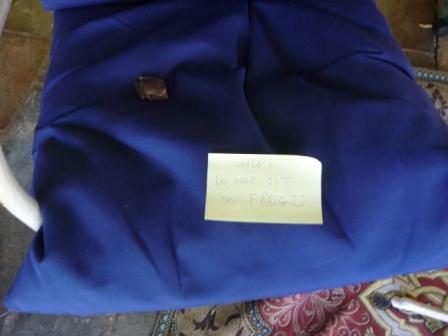 Please do not sit on frog. The rest of the weekend continued with a visit to town for a pub lunch with my aunt & uncle and a browse through the markets & the second hand shop, odd jobs, odd respites on the veranda or at the back table, and odd (in so many ways) visitors: neighbours, birds, wildlife and the LHS neighbour’s cat. One absent visitor was the electrician referred to us by the G.O.’s brother-in-law, contracted to move power points prior to the wood heater installation. He had proved difficult to contact when phoned “he won’t come to the phone, he thinks you’re mum…” and eventually withdrew with an explanation(?) of considerable injuries sustained via the attentions of 3 outlaw motorcycle club members. Oookkaaaaayyy. However, for the entire weekend the sun warmed us, the stars covered a clear full moon illuminated sky, and the peace & quiet soothed our sleep. My nails are ruined, my tank water washed hair will not stay in its usual knot, the G.O. has wasp war wounds and the RHS neighbours mostly drive me crazy but we’ve given ourselves an extra long ANZAC Day break at the end of April, and can’t wait to be back especially as despite the exhortations to use a mate-brother-cousin-friend-in law of one of the locals, we’ve booked a proper (from “in town”) installer to put our wood heater in, and we’ll have another shot at getting an electrician (referred by the firewood mate) out. Add chilly nights and crackling fire to the mix, plus our new internet provider promises coverage, and we’ll be wondering why bother to return to the city. Oh, that’s right…our jobs that pay for all this bliss. I did a double take when I read a) how far away you have to drive and b) what time you got up!!! I may stop moaning about driving 175 clicks for a while now. Great to hear about your extended weekend, even if it was doing pretty much the same as I end up doing at our place 😀 And the wildlife is great. That shot of wallabies is a bit like me taking monkey shots on Main Street! They are just sort of there. That’ll be great! Look forward to seeing more of you Ella.